Storage company helps pure water supplier continue expansion | News by Wales Express News, People Before Profit! A fast-growing pure water supplier has teamed up with a leading North Wales self-storage company to open two new outlets – and more could be in the pipeline. 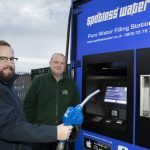 Basingstoke-based Spotless Water, which supplies filtered water for window cleaners, car valeting businesses and even tropical fish owners has opened a new service in Wrexham. It is on Lock Stock Self-Storage’s Ruabon Road site where a big, blue box weighing 12 tons and containing 10,000 litres of pure water is now dispensing it through a self-service system similar to a petrol pump. It follows closely on the company opening their first site in Wales on Lock Stock’s River Lane site in Saltney and they are about to open a third over the border in Shrewsbury town centre. Appropriately the big box is actually a converted storage container and Avril Hayne, Marketing Director for Spotless Water, said: “The Wrexham site is now in service and provides cost-effective, convenient ultra-pure water 24 hours a day, seven days a week. Lock Stock Regional Manager Jeff Woods said: “It’s perfect for local window cleaners here in Wrexham as well as in Saltney because they can just come in and fill up whenever they need to. “It’s also ideal for people who run mobile car-valeting services who can also come in and refill the tanks in their vans as is a constant uninterrupted supply here. “We’re expecting Shrewsbury to open soon and there is plenty of potential for further expansion across our region with our Llandudno Junction site also likely to be of potential interest, close to the A55 and with lots of hotels in the area. The pure water concept is the brainchild of Spotless Water Managing Director Tim Morris who realised there was a demand because he already ran his own window-cleaning and car-valeting business. Pure water means no streaks on glass which makes cleaning 27 per cent quicker and for window cleaners time is money so it has taken off spectacularly with an unexpected demand also coming from people who keep tropical fish which find British tap water a less than ideal environment. Tim applied the concept of self-service petrol stations to pure water and spent two years developing an eight foot by ten foot container that will purify mains water to provide a continuous supply allied to a card and screen system for payment with customers given account cards and key fobs to access the sites and service. Each water dispenser has 26 internal sensors which measure purity, tank levels and filter lifespan so they can be easily maintained while CCTV cameras also monitor their use and they are connected remotely to headquarters via the internet. 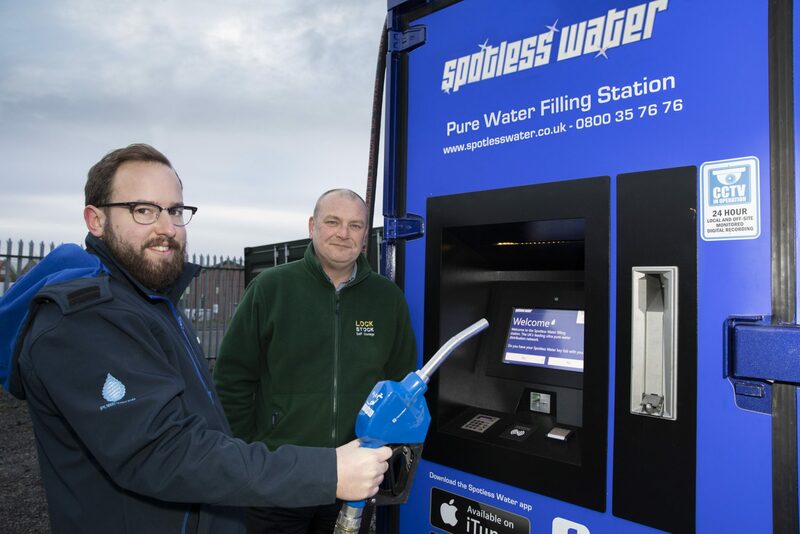 Spotless Water currently have over 30 sites operational and have ambitious plans to roll out to 450 locations over the next three years and storage parks with their secure premises with 24-hour access as well as water and electrical supplies on site have proved ideal. Spotless Water Sales Manager Darren Minton said: “It costs 3p a litre plus VAT so with all the technology that goes into it that’s a competitive price and it’s always available. “Even if a window cleaner has a purifying system at home it will take ten hours to produce 1,000 litres but with this it’s on tap and there’s no worries about maintenance. “The units are made from shipping containers which contains a bespoke system which has been thoroughly tested and includes UV and carbon filters for maximum purity. Lock Stock was founded by brothers Nick and Shon Powell in Denbigh in 1998 and now has 18 sites across North and Mid Wales and the Border Counties and also operates a van-hire business, Take Stock, from three hubs at Llandudno, Chester and Rhyl – they also sell fireworks at Chester, Rhyl and Llandudno and on-line. Their existing sites stretch from Bangor along the North Wales coast at Llandudno and Rhyl, on the Dee at Flint and Saltney, near Chester, and inland at Denbigh, Mold, Wrexham and Newtown in Powys, and at Oswestry and Shrewsbury in Shropshire. Lock Stock Director Nick Powell added: “We are always looking to diversify and to react to the market and working with Spotless Water is just another example of that. “The business started because we reacted to a demand and it has grown in response to demand. Lockstock-3,4,5, 11 Pictured (L/R) Darren Minton, Spotless Water Sales Manager and Jeff Woods, Lock Stock Regional Manager. Pictures by Mandy Jones Photography. 5 Years of Pirate Invasion in Conwy Town!